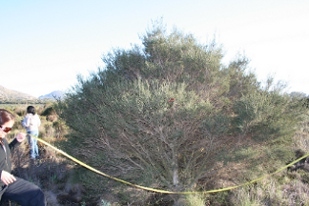 Melaleuca ericifolia Sm. is a shrub or small tree 2-9 m high with pale bark tearing off in pieces. Leaves small, linear, dark green and scattered or in whorls of three. Inflorescences many-flowered, in dense spikes. Flowers white, solitary within each bract. Flowers from September to November. The fruit is a small cylindrical capsule containing numerous minute seeds. Swamp paperbark is native to Australia. Swamp paperbark spreads by seeds and mainly clonal growth. In clonal growth, individual plants are able to cover large areas and produce numerous stems. 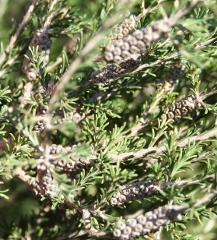 It is not clear as to when the species was introduced to South Africa, but from preliminary observations by the Western Cape Invasive Species team at the Waterval Nature Reserve, it seemed that the oldest plants were about 10 years old, suggesting that the plants had escaped notice until they were large enough to be clearly distinguishable from the surrounding fynbos. Swamp Paperbark grows along watercourses and seasonally inundated wetlands and will form dense thickets in wetlands. This poses a threat to water resources and water-dependent biodiversity and related ecosystem services. This species can also tolerate well-drained situations. There are no registered herbicides for this species in South Africa, although cut-stump treatment with 1.5% Garlon (active ingredient triclopyr) herbicide mix seems to be highly effective. Robinson, R. 2007. 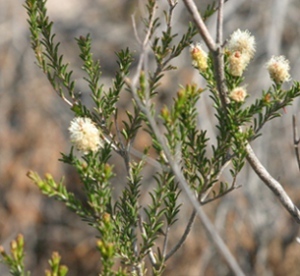 Regeneration mechanisms in swamp paperbarks (Melaleuca ericifolia Sm.) and their implications for wetland rehabilitation. PhD thesis. School of Biomedical Sciences, Victoria University, Australia.